One of five sons, Jim Farley was born on May 30, 1888, to Irish Catholic immigrant parents in Grassy Point, New York. His father was involved in the brick-making industry, first as a laborer and later as a part owner of three small schooners engaged in the brick-carrying trade. His mother was a housewife. When Farley was ten years old, his father was fatally injured when the family horse reared up and accidently kicked him in the ribs. Farley's father left a small life insurance policy (worth $3000) and his partial ownership in the schooners to Farley's mother. This inheritance was not enough to support the five boys. Around age twelve or thirteen, each of the boys would spend the summers working as unskilled laborers at the brickyards in order to supplement the family income. Eventually, Farley's mother purchased a small grocery and saloon where Farley and his brothers worked alongside their mother. Farley attended public schools, completing high school and, in his own words, "did enough studying to get by." In the fall of 1905 he enrolled in Packard Commercial School of New York City to study bookkeeping. Finishing in the early spring of 1906, Farley obtained a job with the Merlin Keiholtz Paper Company and later the United States Gypsum Company where he moved up the ladder and finally ended up a salesman. He would stay with this job for what he says was fourteen or fifteen years. Farley states in his autobiography that he always had his heart set on a political career. In 1911 he officially began his service as a politician when he was elected town clerk of Grassy Point. During the next seventeen years he held various state and party offices and became secretary of the Democratic State Committee in 1928. Introduced to FDR by Ed Flynn, FDR asked Farley to run his 1928 campaign for New York governor. Working closely with ER and the Women's Division, Farley helped FDR win his narrow victory in 1928, his landslide in 1930, and his nomination and election to the presidency in 1932. Like his sometime rival Louis Howe, Farley grew close to both Roosevelts and respected ER's organizational and political talents. FDR appointed Farley postmaster general and party chairman in 1933, and he became one of FDR's closest political advisors. Farley also controlled patronage in the new administration and became very influential within the Democratic party throughout the United States. Farley was dedicated to the New Deal and to getting legislative support for FDR's programs. Additionally he helped to bring about the end to Prohibition and the defeat of the Ludlow Resolution, a 1939 attempt by Congress to limit the foreign affairs powers of the President. 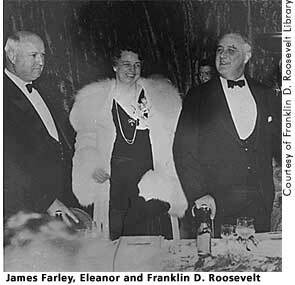 Farley's close relationship with FDR deteriorated in 1940 because Farley opposed FDR's pursuit of a third term and because FDR believed that Farley had presidential ambitions of his own. In 1940, Farley resigned as postmaster general and party chairman to mount an unsuccessful presidential bid. ER flew to the convention to try to repair the damage in the Roosevelt–Farley relationship, and although Farley remained close to ER, he felt betrayed by FDR and refused to join FDR's 1940 campaign team. In 1938, Farley wrote his autobiography Behind the Ballots. After leaving the administration, Farley worked for the Coca-Cola Export Corporation of New York until his retirement in 1973. Remembered as one of America's greatest campaign managers, Farley remained active in state and national politics until his death on June 9, 1976, in New York City. The Concise Dictionary of American Biography. 5th ed. New York: Charles Scribner's Sons, 1997, 370. Farley, James A. Behind the Ballots: The Personal History of a Politician. New York: Harcourt, Brace and Company, 1938, 3-23. Graham, Otis L., Jr. and Meghan Robinson Wander. Franklin D. Roosevelt, His Life and Times. New York: Da Capo Press, 1985, 125-126.